Clem Hellmann Leadership Award – Quality Block Co. Inc.
February, 2018 — The Arizona Masonry Contractors Association (AMCA) established the Clem Hellmann Leadership Award in memory of Clem and to honor his lasting contributions to our industry. The Clem Hellmann Leadership Award recognizes an individual who has made significant contributions to the masonry community through Leadership of, and/or involvement initiatives that have resulted in industry-wide impact and is representative of the highest level of leadership and involvement. Through this award, AMCA hopes to preserve Clem’s memory and inspire our next generation of industry members to serve, promote and invest in our industry as Clem did throughout his 30-year career. 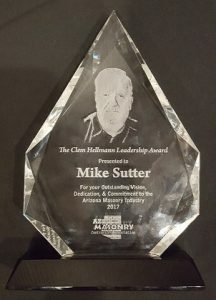 the First Recipient of the Clem Hellmann Leadership Award was presented to Mike Sutter with Sutter Masonry. Your passion, dedication and leadership for the masonry industry both locally here in Arizona and on a national basis with the Mason Contractors Association of America (MCAA) has made a difference for our industry. 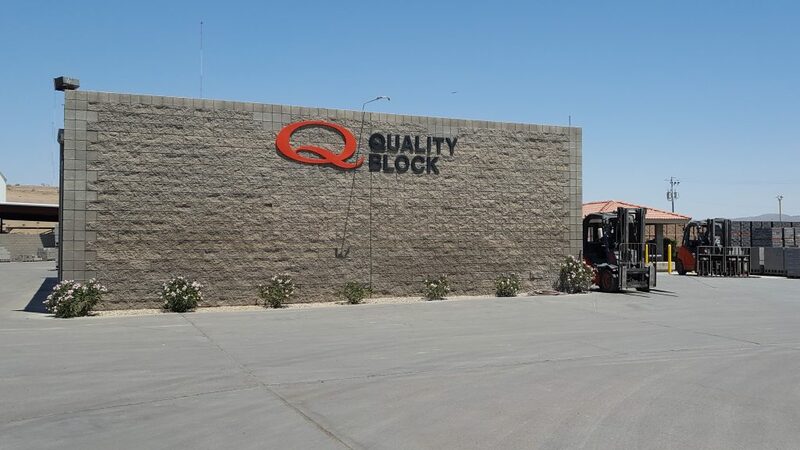 Clem & Mary Jo Hellmann purchase Quality Block Company. This image is Clem standing at the front entrance in 1987. At that time, Clem was not in the masonry industry and knew nothing about block manufacturing — but he was an experienced businessman. He believed that if he hired the right people with the knowledge, produced a high quality product, emphasized customer service and was involved in the business … he would be successful. 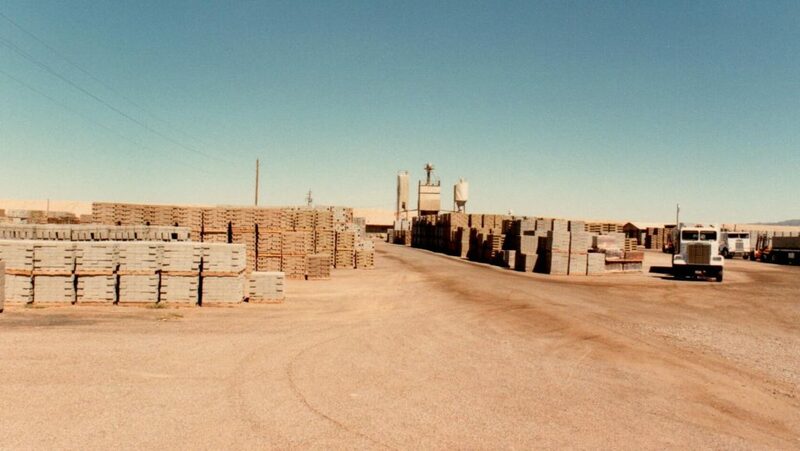 Through participation and his support of the Arizona Masonry Guild, the Arizona Masonry Contractors Association and the Central Arizona Homebuilders Association — Clem quickly learned about the masonry industry in the Phoenix market. Clem Hellmann — 30 years of support and participation in the masonry industry. 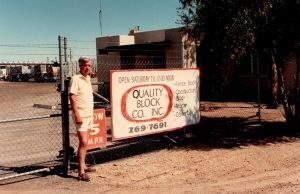 Clem Hellmann was owner and President of Quality Block Company for over 30 years. He passed away in late October of 2017. 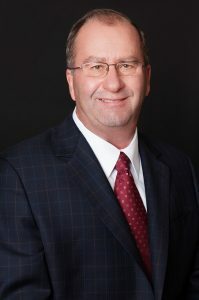 His dedication and passion for the masonry industry was well demonstrated through his continuous support and participation in the Arizona Masonry Guild and the Arizona Masonry Contractors Association…serving on the Board of Directors for both associations, holding various offices, committee work, as well as sponsorship for various events for these organizations. He was often the “Master of Ceremonies” for masonry events including AMCA’s Annual Dinner, Fastest Trowel & Masonry Skills Challenge and the Arizona Masonry Guild’s Excellence in Masonry Architectural Awards Banquet. Clem was a strong supporter of the industry’s workforce development efforts. While serving on the AMCA Apprenticeship Committee — he was involved with the move of the AMCA’s apprenticeship program to the East Valley Institute of Technology (EVIT) — where it is still in place today. He also served as the Chairman of the Advisory Board for the Construction Technologies Class at EVIT. He believed the way to attract new talent into the industry was to expose students to the masonry trade in high school. In his words, “If we can interest students at this level, it is the best way to begin to fill the vast need for construction personnel and careers as all levels”. His belief was so strong that he paid for a full-time masonry instructor at EVIT to work directly with construction students for over 5 years. Recognized in the masonry industry… In 2007, Clem was presented with AMCA’s Leader of the Year Award. This award is to recognize a member of the masonry industry who contributes time & expertise to industry associations, plays an active role in civic & community affairs, and assists fellow industry members. In short, he or she exemplifies the very best by continually bringing credit to the industry. Clem’s service and contributions to the masonry industry was so well respected that he also received the Arizona Masonry Guild’s Bart Del Duca Award in 2007 as well. The Arizona Masonry Guild bestows that honor upon one person in recognition of notable and outstanding performance, service or significant achievement in the masonry industry. 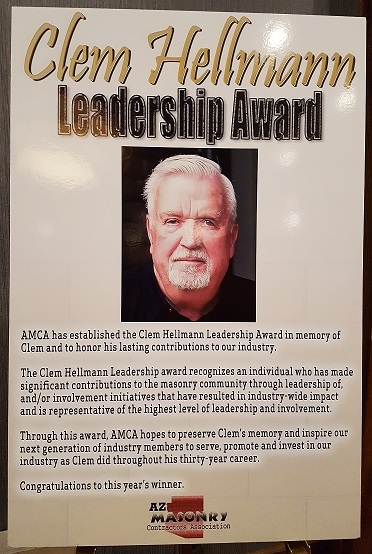 The Hellmann Family and the employees of the Quality Block Companies appreciate the AMCA for establishing this award in Clem’s memory.